After the awesomeness of our first coding bootcamp in Bali, we couldn’t wait to hit the road again for our next code camp in Thailand. 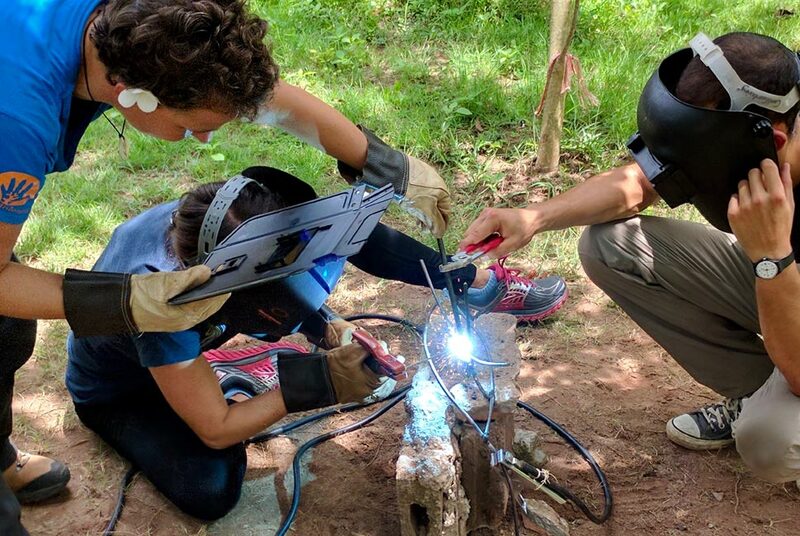 A new cohort, new country, and a new experience altogether…CodingNomads definitely keeps us on our toes! 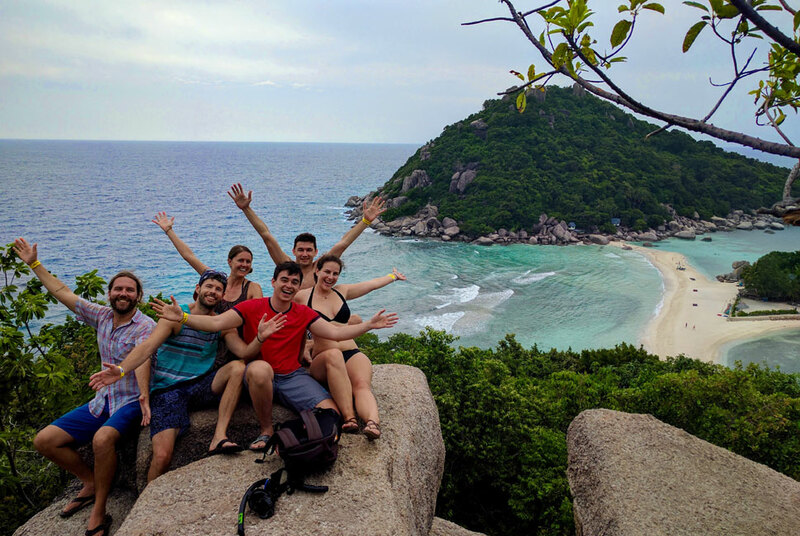 We selected the small island of Koh Tao to host our bootcamp for multiple reasons – its awesome coworking space Tao Hub; its affordability for our students; its endless weekend activities of jungle hiking to breathtaking viewpoints, coral reef exploration, and the slow pace of island time to balance our fast-paced course. With our students hailing from the United States and Bulgaria, our many hours in transit paid off as our ferry arrived at the tropical paradisiacal island. On the eve of our first class day, we dined together on the beach, sitting on pillows around a low Asian-style table. We immediately started bonding over delicious and spicy Thai food, getting excited for the course, and laughing about the novelty (and discomfort) of sitting on the floor! 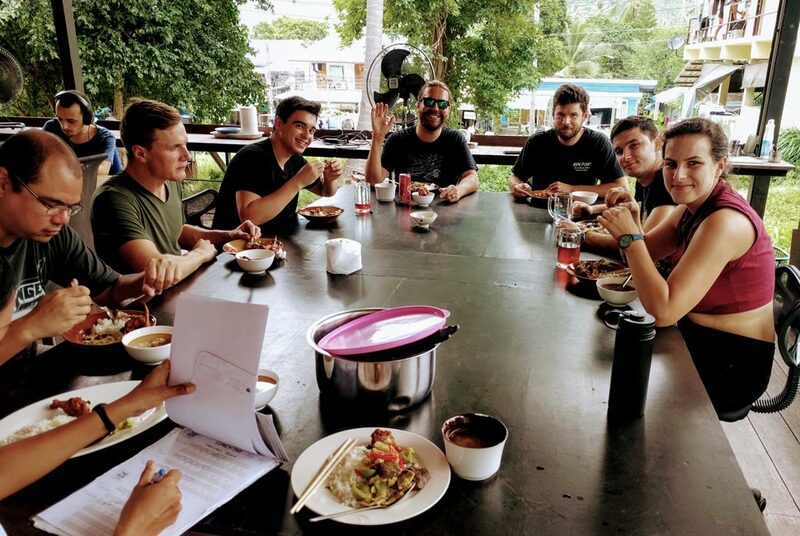 The CodingNomads Thailand cohort was all laughs from the start, setting a fun, friendly, positive tone for the months to come. 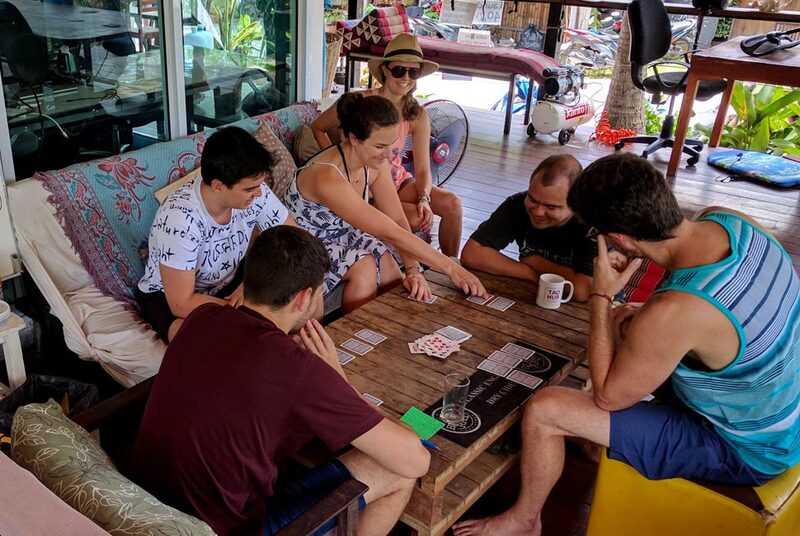 Keep reading below for the highlights – and also some hiccups – from our coding bootcamp in Thailand. Our Java + SQL + AWS coding bootcamp is a headfirst dive into server-side software engineering, and prepares students for the day-to-day work as an engineer. Our students arrived with no prior experience aside from self-study and our pre-coursework. In Thailand they spent hours every day learning new material, and applying it through labs and project work. To learn more about our course structure and syllabus, please visit our website Java coding bootcamp page. With newly acquired skills, our cohort was bursting with ideas for their final team project. We loved seeing the creativity and excitement growing in sync with the students’ technical capabilities. 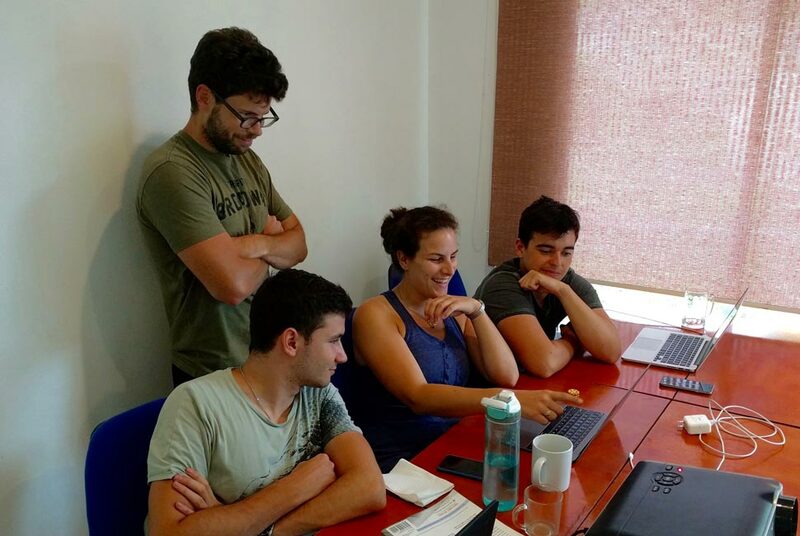 After eight weeks in Thailand, our cohort continued working together on their portfolio project for four weeks online as a distributed software engineering team. Given the rising global interest in Blockchain cryptocurrencies, the group decided to build a cryptocurrency monitoring application called CryptoPeek. CryptoPeek integrates with 3rd party APIs to pull real-time data on the top 30 cryptocurrencies by market cap. You can see CryptoPeek’s source code here. CryptoPeek is both a RESTful API and MVC application, which enables the request and delivery of information via a RESTful API interface, as well as through a web browser. The RESTful API returns results to programmatic requests in JSON. The MVC application is a dynamic website where the front-end code is generated by the server and sent to the browser as needed. 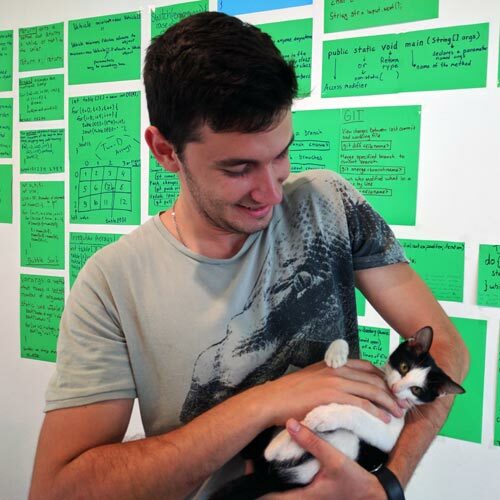 — Taner Ali, CodingNomads Thailand Student Read full review. Using Git and Jira collaboration tools, the team built out several functionalities including user management, security, caching, a mechanism to alert users in real-time regarding price spikes and dips, real-time arbitrage opportunity monitoring, and more. CryptoPeek was coded in Java using the Spring Framework, Maven, Hibernate ORM, MyBatis, Gemfire, Thymeleaf, and several other open source projects. It utilizes a MySQL database hosted on AWS Relational Database Service (RDS), and was deployed using Apache Tomcat in an autoscaling AWS EC2 (cloud-based servers) group behind an AWS Elastic Load Balancer (ELB). This combination of technologies is how real-world enterprise server-side applications are built, which can scale to millions of users. 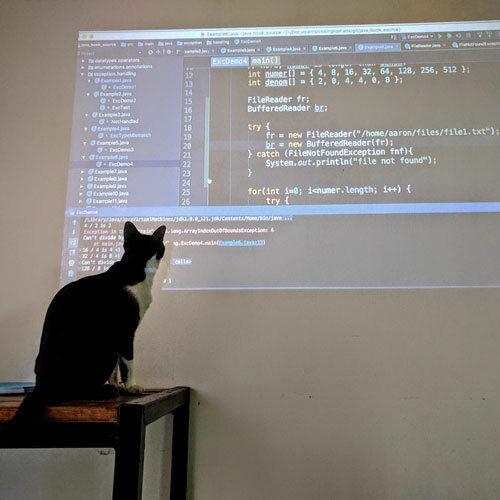 We’re extremely proud of our students’ progress in demonstrating professional skills they can immediately apply to software engineering jobs worldwide. Amidst the wave of technical information taught in our bootcamps, we also help students prepare for finding work after the bootcamp. We dedicate time for mock interviews, and assist students with their job search materials and profiles. We provide guidance for gaining more project experience, approaching prospective employers, networking, salary negotiation, and more. As a resource for our students and the community, we published job search tips and advice in a blog post, “How to find a job after a coding bootcamp.” We also published a guest article on Course Report’s blog, “How to find a remote job after a coding bootcamp,” with specific remote work tips for aspiring digital nomads. 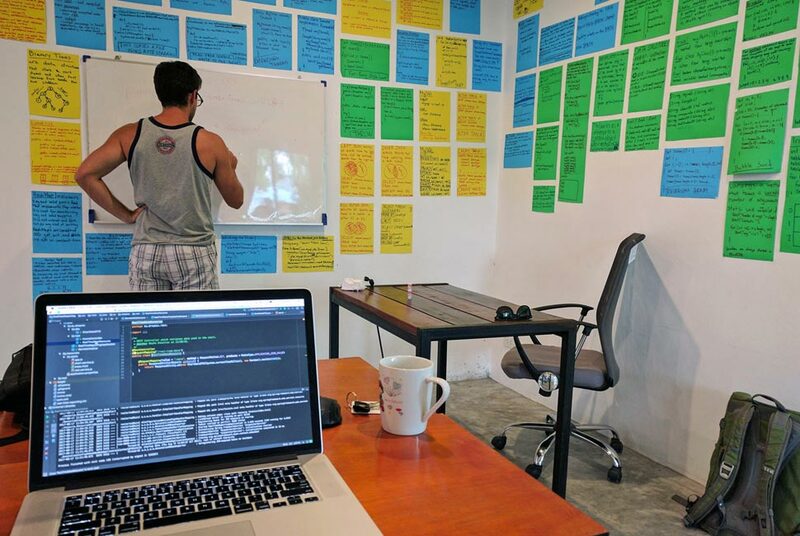 Our coworking space Tao Hub was a key highlight to our coding bootcamp experience. More than just an office, we met there every day for team breakfasts and lunches, and often stayed after class to order dinner and continue coding. 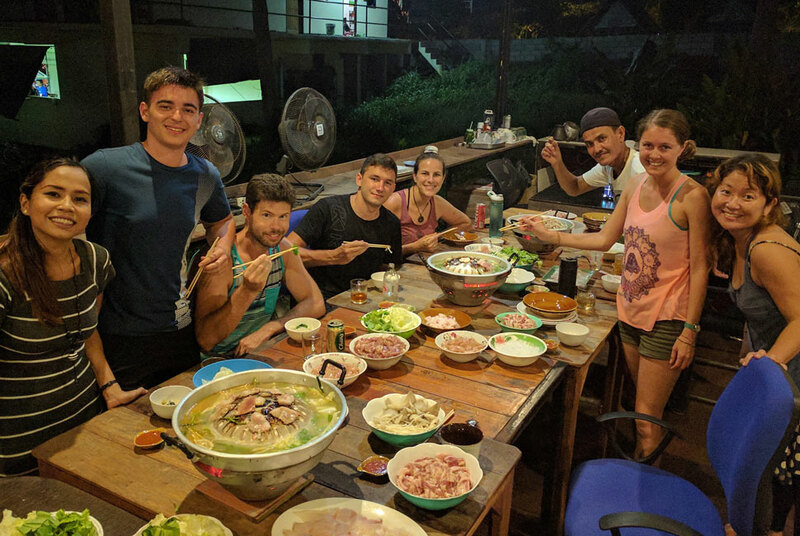 All our students agreed that Tao Hub had the best home cooked Thai food on the island, and all the spicy chiles anyone could handle! With its large open-air patio, cozy couches and friendly faces, Tao Hub was the perfect hangout spot. Located in Mae Haad, we could walk to the beach for sunset, but were far enough away from the Sairee Beach nightlife to stay focused. We’d meet at Tao Hub on the weekends before scooting off on an adventure, or play a few rounds of cards before going out on the town. We became close friends with the owner Moe and her wonderful staff. Together we had several “Thai-style Korean Barbecues” and roll-your-own-sushi parties to celebrate birthdays, or simply to spend time together around a giant dinner table. 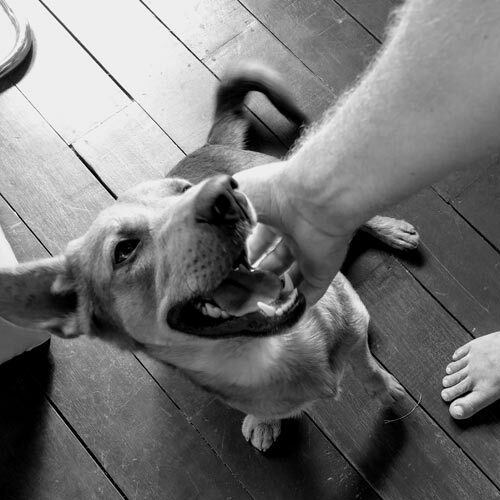 We had resident cats and a dog at Tao Hub, who kept us smiling even through the toughest coding sessions. 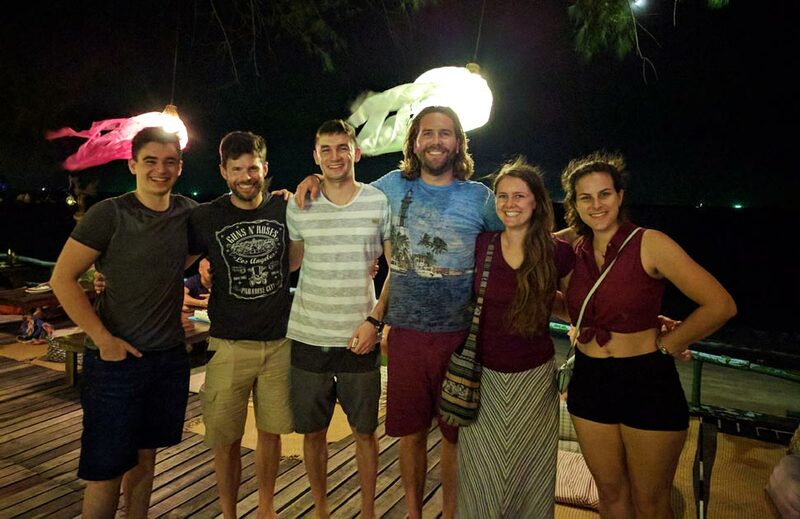 Tao Hub was our true home on Koh Tao, and the Tao Hub staff and coworkers were our family. Together our Tao Hub crew came from the US, Bulgaria, Japan, Myanmar, Thailand, Singapore, Denmark, Holland and France, with several more friends who passed through from other countries. and friendship prevails when you share the common thread of world travel. 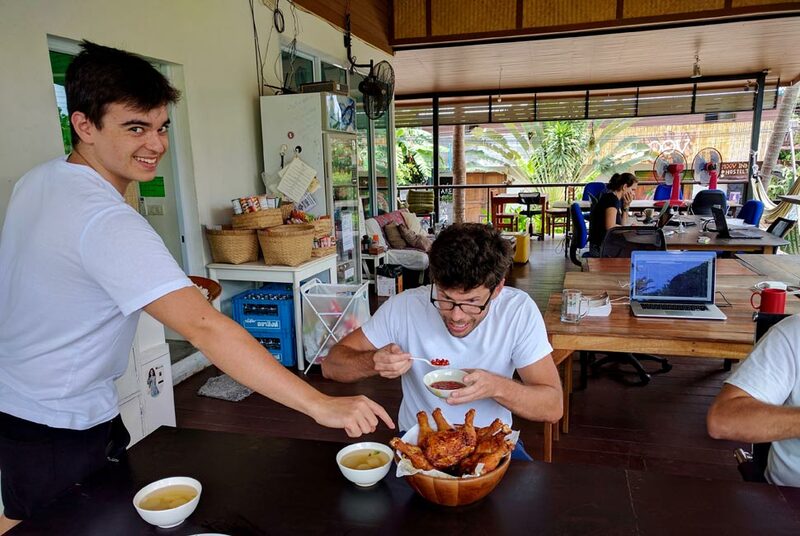 This is one of the many reasons we were inspired to start CodingNomads: to bring people of diverse backgrounds together to travel AND learn to code, making the world a smaller and more friendly place through each bootcamp. We are so grateful for our time at Tao Hub and can’t wait to return! Characterized by dramatic green hills, aquamarine waters and world-renowned scuba diving, we thoroughly enjoyed living in Koh Tao. We spent our weekends exploring the island on scooters, discovering new beaches, and snorkeling + diving Koh Tao’s reefs. Life in Koh Tao was wonderful, but living on an island in a developing country also had its challenges that we want to address upfront. Living in the jungle can be tough, and we each took a turn getting sunburned and scraped, bruised and bug-bitten. However a couple slips and falls on steep unpaved roads and slippery rocks just brought our team closer together. 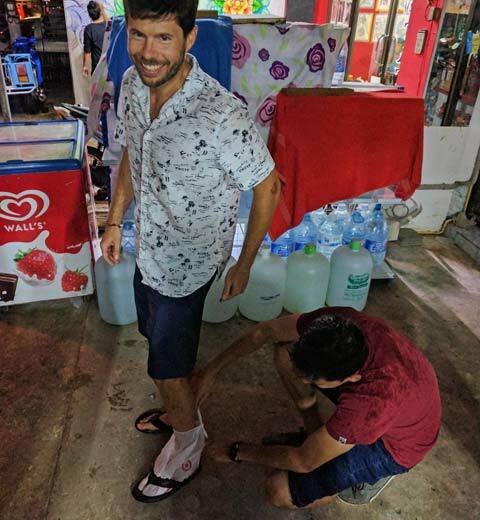 Here’s a photo of Dani bagging Aaron’s foot during a rainstorm to prevent his ankle bandage from getting wet. Now that’s teamwork! The beautiful small island also has more trash from tourists and locals than it can handle, with litter accumulating in some river beds and the sea. 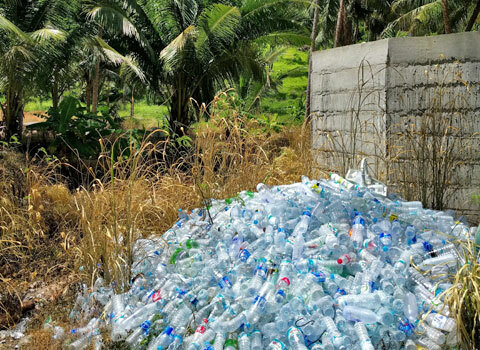 The unrelenting waste from plastic bottles alone is starkly pronounced on an island with limited recycling resources, and the mainland hours away. 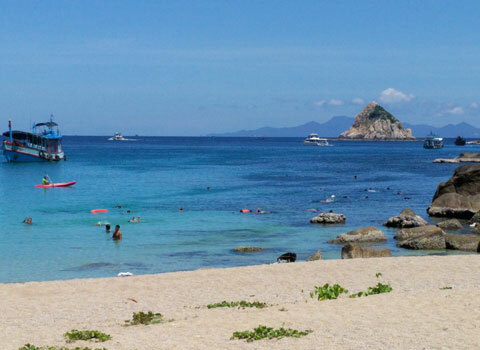 The photos below are of our favorite pristine beach Aow Leuk, with plastic bottles piling up behind its beachside restaurant. We also can’t ignore that Koh Tao has gained unfortunate infamy for several tragic, unresolved tourist deaths. It’s true that these cases were mishandled by the local police, casting a shadow of distrust over the island. It’s true that tourists should know about these crimes and exercise caution while visiting. 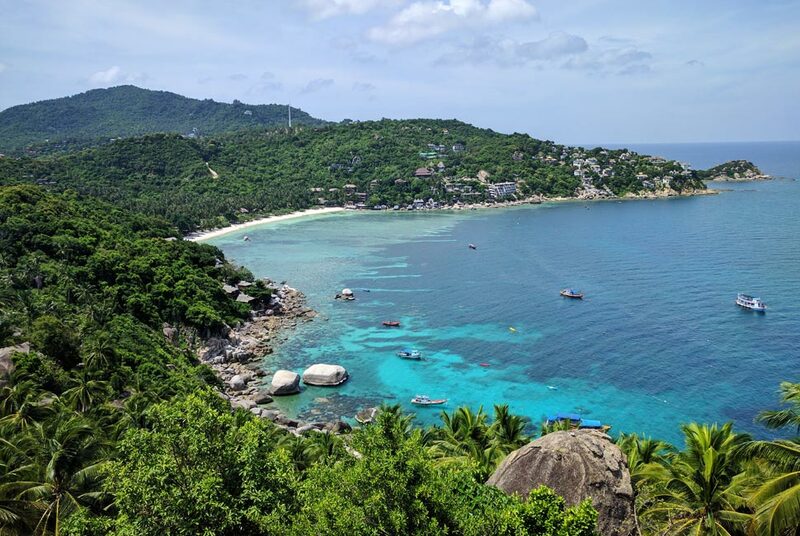 But it’s also true that tourists should exercise caution anywhere they visit, and that Koh Tao is no more dangerous than other global tourist destinations. We met countless expatriates who lived in Koh Tao before and after these occurrences, and still claim Koh Tao to be a very safe place. Of course these crimes should not be minimized or overlooked, and we hope with all our hearts that the true perpetrators are brought to justice. But the thousands of kind, wonderful, hard-working people living there shouldn’t be negatively judged based on the crimes of a few. We were touched by the welcoming vibe we felt there, and are glad we gave Koh Tao a chance. 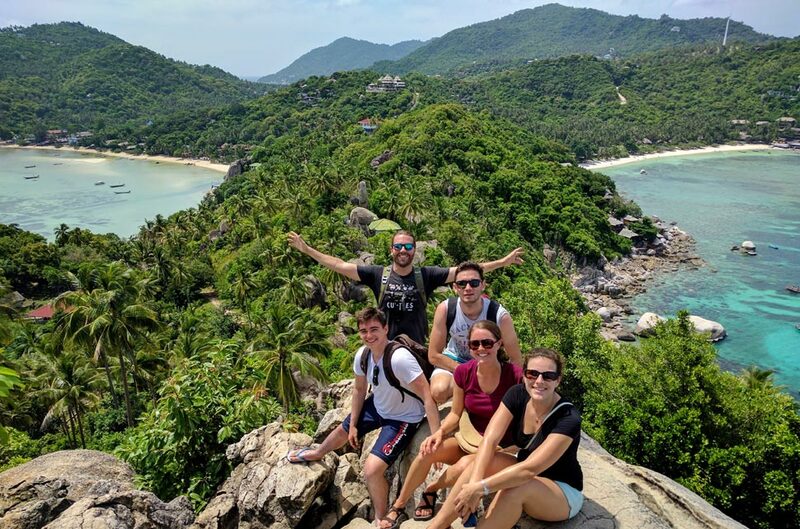 We all got in pretty good shape by climbing up Koh Tao’s steep hills to see amazing views of the island. 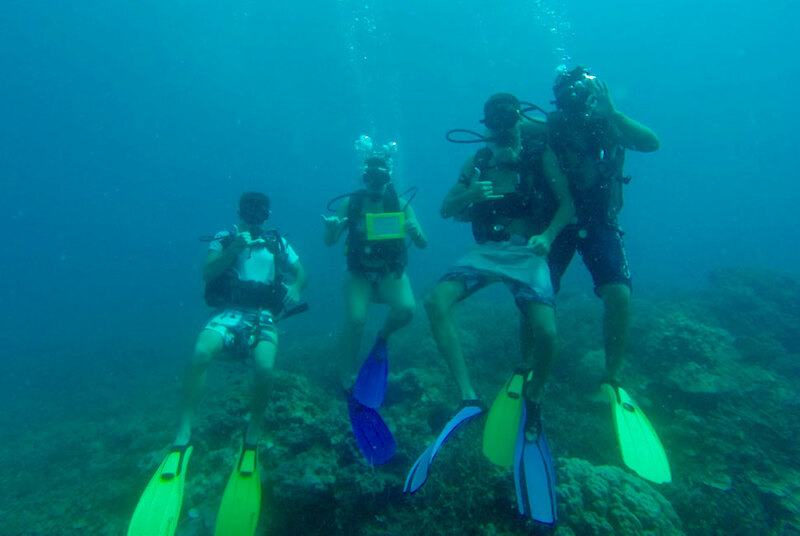 Below are some classic Koh Tao group shots! Koh Tao gave us a lot to love, so we wanted to give back. 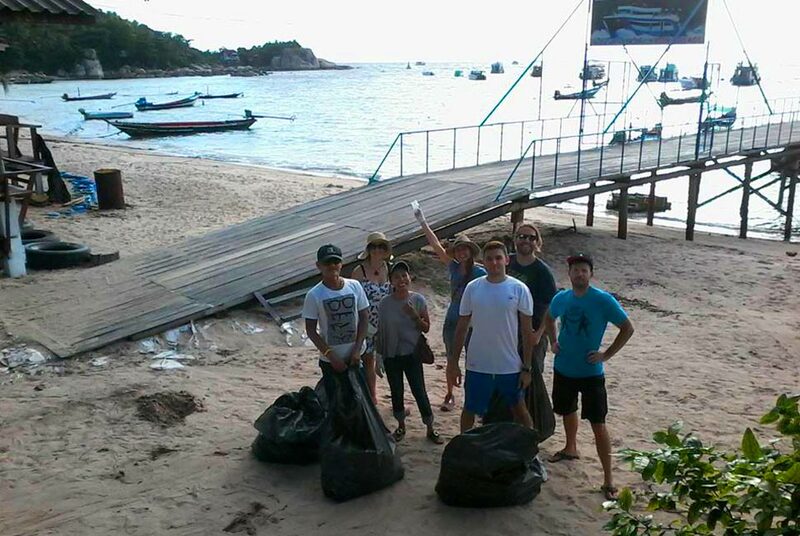 CodingNomads volunteered on multiple occasions to pick up trash in our neighborhood and on the beach, as well as help build a coral reef revitalization structure with Coral Gardening. Most of all, we just loved hanging out and laughing together, enjoying our time to learn, grow, and experience the world. …had to put this one in too 🙂 Chay spoiling the team moment with a cold spray! 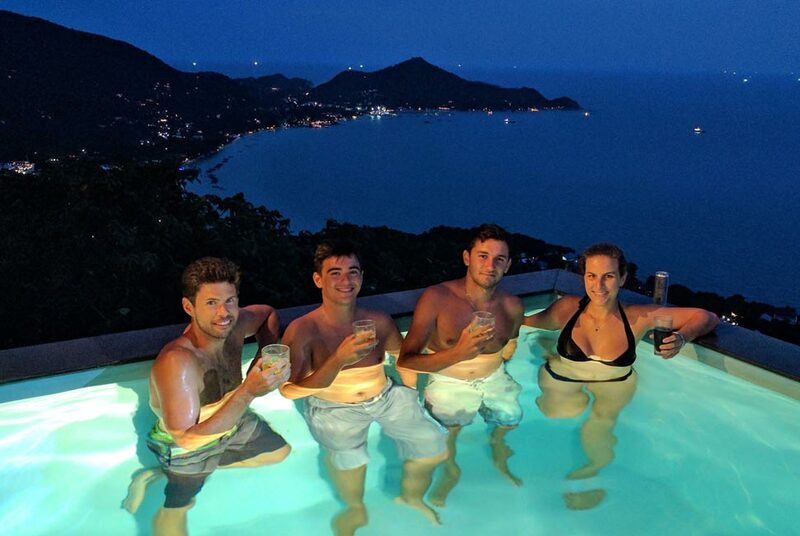 Doing a coding bootcamp abroad has its challenges, but also incredible rewards. Our students become a technical support group to help each other with the class material, and they also become friends. The bond we formed in Koh Tao was deep, and it was hard to say goodbye. Yet now that we are all seasoned travel pros, we are certain we’ll meet again! 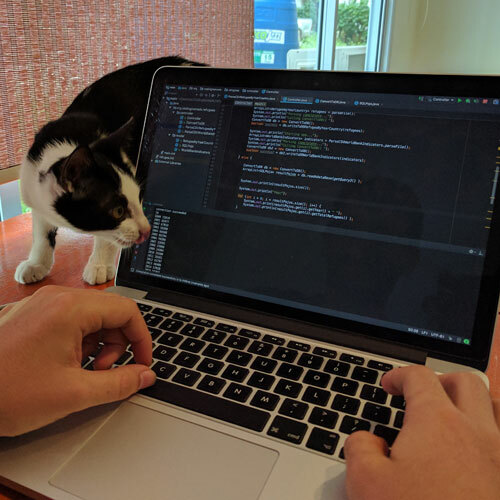 We’re currently in Playa del Carmen living the dream while learning the code. Check out our Facebook and Instagram for fun photos and updates! 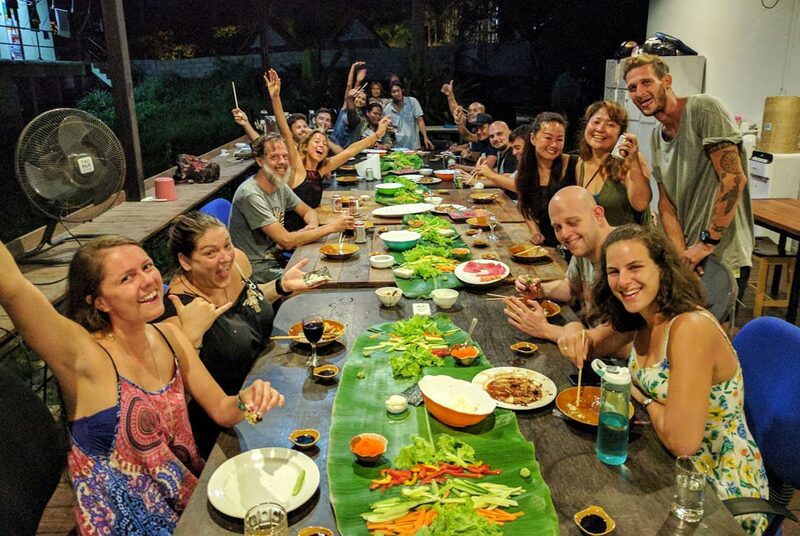 Our next scheduled bootcamp is in Bali March 2018 – we can’t wait to go back! In June 2018 we’re heading back to our roots, holding a Tahoe-Reno coding bootcamp. 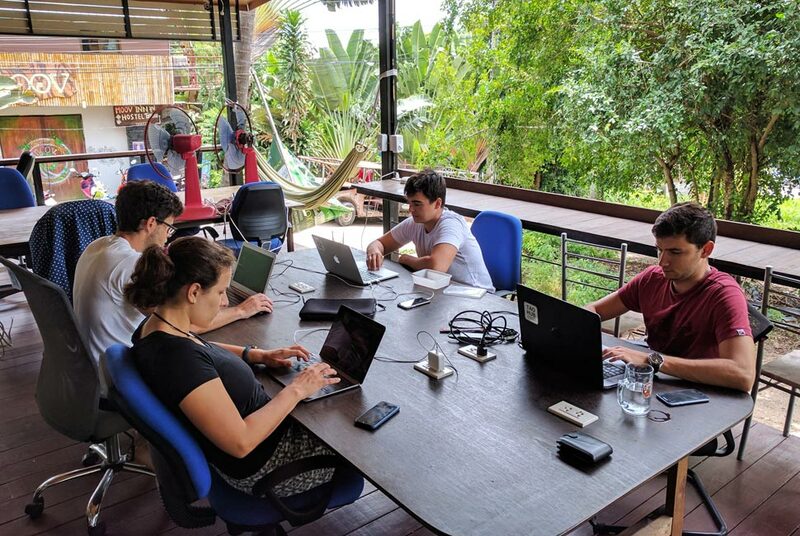 If you’re interested in learning to code, CodingNomads is a very fun, very effective way to do it. Please get in touch directly with any questions.